These three single photos are from different stages of the 7/8 December display in Rovaniemi. They all show Bouguer's halo, i.e. 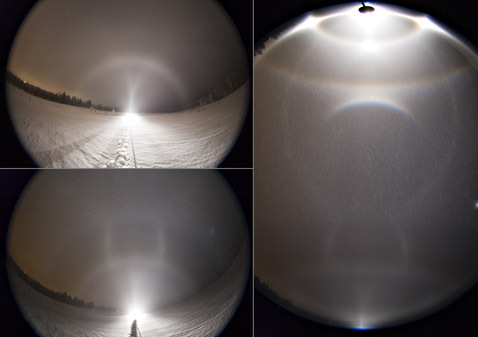 fogbow together with halos. But in reality halos and fogbow were seen mainly separately, in swiftly passing ice and water clouds. 30 seconds exposure has captured them nicely in the same frame. Hehe, that primary fogbow together with the blue spot -circle looks surreal! Funny stuff! And the amazing series of posts continues! Congrats yet again! Back in the day we used to have St. Andrew's group of halos on the top of the list, but these days it seems that St. Riikonen's group of halos is a strong contender. Prophet Riikonen (he who holds the lamp) has, in one strong revelation, given us so much new stuff that it continues to boggle the mind. Nice halo prophet. I notice the convex parry is on its own and no UTA is visible. I wonder what would cause parry to be on its own without UTA? Well observed again, Michael. Missing of concave Parry is due to triangular crystals falling with their edge straight up. Also other Parry halos in simulations point towards this conlusion. As for missing of upper tangent arc, there is a bit of a diffuse arcs, which form in same crystals as tangent arcs. So perhaps inside the overexposed region there lurks a tangent arc as a weak brightening on 22 halo. Why Parry is without tanget arcs, that's a good question for which I have no answer. We need crystal samples which are precision targeted for each photo frame from these displays. And for that more than one halofreak is needed. Anyway, I will return to this issue in some later posting. There should be slightly better photo of this Parry without upper tangent arc. Maybe I put it up next now that we talked about this. I don't know Marko I can see clear gap between the 22d halo and the convex parry and where that gap is there is no UTA. Did you get any photos that show the lamp side of the display by chance? I checked the original RAW-image. The top of 22 halo (including the bottom of Parry) is indeed overexposed. There are lamp side photos mainly from the stage when random stuff was strong. I'll put them up next.